Is is possible to travel to Japan on a budget? Definitely! Japan is one of the most fun and amazing travel destinations in the world. However, many travelers are reluctant to plan a trip to the Land of the Rising Sun because of the cost. 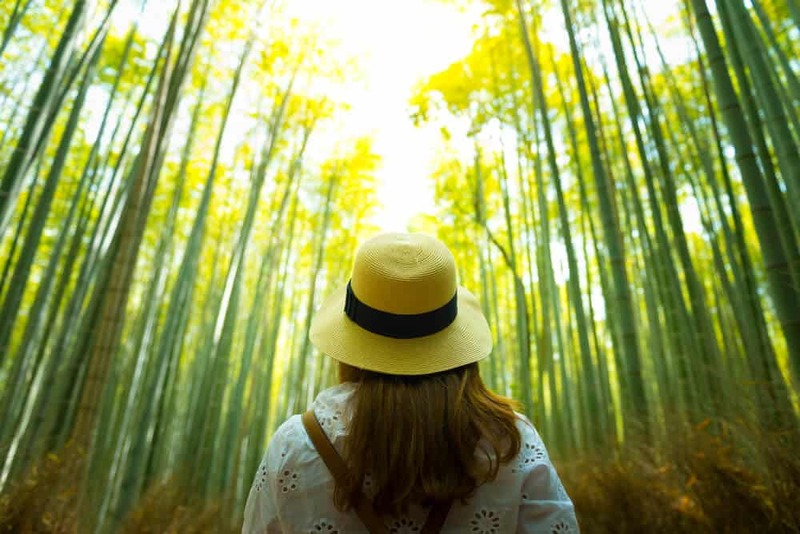 Known for being an expensive place to visit, many Japan lovers give up when they hear how much it costs to travel to Japan. In doing so, they miss out on the trip of a lifetime. It’s true that Japan has tons of luxury hotels, world-class restaurants, and first class transportation options that cost more money than most people’s mortgages. However, Japan also has lots of cheap lodging, amazing food, and transportation options that are very easy on the wallet. In fact, Japan can be one of the CHEAPEST destinations to travel on a budget. 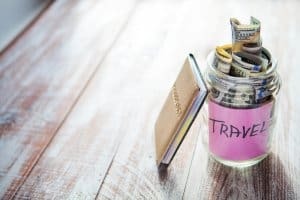 If you want to visit Japan on a budget, this article will provide you with all of the tips, tricks, and advice to save you as much money as possible. While it is possible to visit Japan by boat (namely from Australia, China, Taiwan, and Korea) the vast majority of visitors choose to go by air. If you live in one of these nearby countries and have LOTS of time, check out your local boat companies for deals. Sometimes they sell last minute tickets at a fraction of the cost. However, it’s almost always more efficient to travel by air. So here are 5 tips to getting the cheapest airline tickets to Japan. When searching for a flight to Japan, booking as far in advance as you can is best. Waiting until the last minute to grab reduced price tickets can certainly pay off, but it’s a big gamble if the tickets sell out (which happens more often than not). You’re better off by being prepared, planning in advance and choosing to visit Japan at a cheaper time of year. I usually buy my tickets at least a month before my travel date. I found that this is the latest I can wait before tickets sell out or really get expensive. Just after the New Year holiday ends (people are usually back to work by January 5th) up until the end of March. However, Hokkaido has lots of visitors during this time due to all of the incredible ski slopes and winter foods. The world-famous Snow Festival also takes place in early February, which makes finding a cheap ticket to Hokkaido difficult. Mid May – June is also a cheaper time to visit. While the winter season might not be the best time to visit Japan in terms of weather, you’ll usually save money on plane tickets. Winter foods in Japan are absolutely delicious as well. Delicious hot pot dishes, fresh crab, and other seafood are especially delicious in winter. If you want all of the details and insiders tips on when to visit Japan, check out our best time to visit Japan guide. Or course you could get cheap airlines tickets by choosing non-direct flights with long, inconvenient waits in between. But who wants to do that? Sure, you can save some money, but you’ll be giving up a lot of time and comfort by doing this. Before going this route, spend an hour or two searching the Internet for the best deals. You can decide if a reduction in price with a 12-hour wait in some random airport is worth the inconvenience. 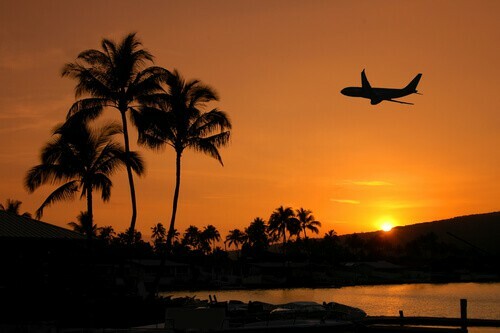 Of course, if you are willing to fly with any airlines, you’ll have the best chances of finding a cheap flight. However, I highly recommend you only use reputable carriers. There are lots of airlines with cheap flights to Japan, but they usually have very long layovers or delays, poor service, and safety issues. Sometimes, it’s just not worth the risk. So to minimize your chances of having a bad flight, go with a reputable airline company. Airlines that fly to Japan differ depending on where you live, but I like Hawaiian Airlines, Japan Airlines (JAL), All Nippon Airways (ANA), and Korean Airlines. I always check the Hawaiian, JAL, and ANA Airlines website first. Most of the time, I find the best deals directly on their website. Booking directly with the airline carrier is usually safer and more secure than booking with a third-party company. Be sure to check the prices often, as they can change frequently. If the prices are high, proceed to step 3. Other websites such as Skyscanner, Expedia, Jetstar, Kayak, Lastminute, and Farecompare are also good places to analyze ticket costs. 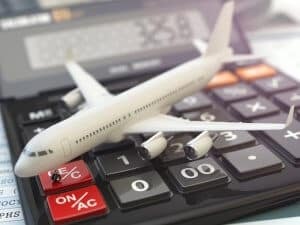 Remember that flight costs will depend on where you’re flying from. Heading out from a major “hub” airport rather than a local one will certainly cut costs. 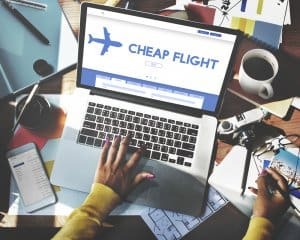 These websites search hundreds of travel sites and find the cheapest tickets out of all of them. Filter the searches by the airline carrier and how many layovers you are willing to have on your trip. Be sure to check the prices for different dates. Sometimes traveling just 1 day later can drop the prices significantly. NOTE: I just do this to see what the average prices are for that dates of travel. I DO NOT purchase my tickets through Kayak unless there is an amazingly good deal though a REPUTABLE company. While there are usually cheap tickets that show up in the results, most of these are either a) flights with LONG layovers or b) flights listed by bad, untrustworthy third party companies. In my experience, many of the companies that are listed on their website aren’t very trustworthy. Many of them have very bad reviews, with some even having complaints filed against them. Stick with the bigger companies like Expedia. Just use it to check the prices of the airlines you want to fly on. Choose the best 3 or 4 itineraries you found on Kayak/Expedia/Priceline/etc. I usually have the best results with Expedia. At the bottom of the Expedia website, there’s a section called “Global Sites” with pictures of flags of different cultures. Choose a different country and search for the same flight. The ticket prices might be lower if you book it through another country with Expedia. If all of the flights to your desired airport in Japan are crazy expensive, consider flying to a different airport and then using the JR Rail Pass to take the train the rest of the way. If you don’t mind having a longer trip, the JR Rail Pass is a good way to cut costs. You can fly into another major airport in Japan and then cash in your rail pass at the nearest participating station. Then you can take the bullet train to your desired location. While this does take more time, it can save you money and is much more fun that riding an airplane. The seats on the bullet train are much more spacious than a plane and are much easier to travel. The only downside is that the bullet train doesn’t have space for big pieces of luggage. 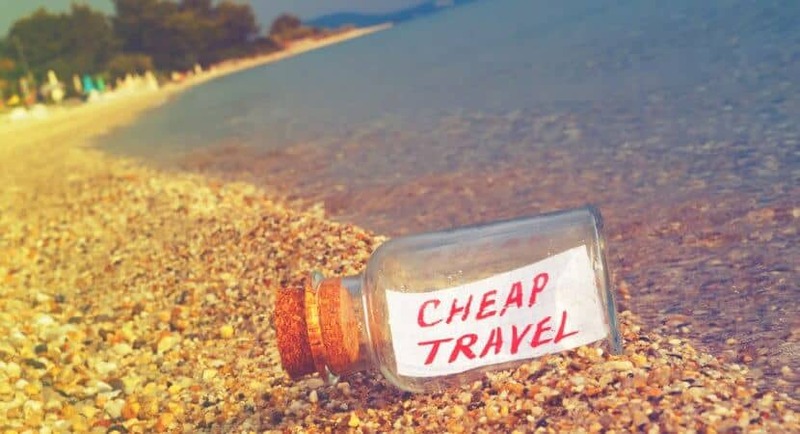 Finding a cheap way into the country is only half the problem. Domestic travel within Japan is also expensive. Of course, you could explore only one or two cities, which can cut costs dramatically by only paying local fares, especially if there are city passes available. What makes Japanese so awesome is traveling to different areas to eat local foods and to experience the culture throughout Japan. If you want to explore many places in Japan, purchasing a travel pass will be your best best. These passes can save you both time and money if you plan to travel a lot in Japan. The Japan Rail Pass is essential if you want to experience all that Japan has to offer. This pass allows you unlimited rides on most JR trains, including the bullet trains, as well as some JR buses and the JR ferry to Miyajima. This pass opens up the whole Japan to you. You’re free to travel wherever, and whenever you want. I highly, highly recommend getting this pass. This pass also makes traveling much easier. You don’t need to research ticket prices or deal with buying or keeping track of your tickets for each trip. Just walk on through the gates on the side and show your pass to the attendant. Also, if you don’t mind sitting in the unreserved area, you can walk straight onto the train too – although reserving specific seats ahead of time is certainly recommended for busy times/seasons/routes. 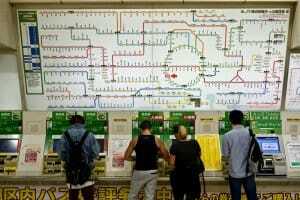 IMPORTANT: You can’t buy a Japan Rail Pass while in Japan. You must purchase your pass before you arrive in Japan. The pass is only for those on a tourist visa. Also, keep in mind that the JR pass cannot be used on every type of transport. For example, you cannot ride the NOZOMI or MIZUHO type bullet trains using a Japan Rail Pass. This isn’t usually a problem, though. The NOZOMI trains travel the exact same route as other types of bullet trains but only stops at major stations. A full list of what you can and can’t use the pass for can be found on the rail pass website. There are two types of pass you can buy. A “green pass” allows you to sit in the first-class section of the train. However, not every train has a green car (first class section). The “ordinary” JR Rail Pass is the more economical option. Both of these passes can be used to make seat reservations for the bullet train. Passes are available for periods of 7 days, 14 days, or 21 days. The countdown will start on the day you activate your pass. You do not have to activate it as soon as you arrive in the country. You can redeem it anytime during your trip. Just take your rail pass voucher to a JR Station that can redeem it. A list of places should be included on a sheet with your voucher. However, most big, urban JR stations can activate your rail pass. The passes may seem expensive but can save you an incredible amount of money if you travel a lot during your trip. A round-trip ticket from Tokyo to Kyoto would already cost 28900 yen, nearly the full price of a one week pass. This itinerary would cost you 41,640 yen, not including all of the local trains you’ll ride within these cities. If you were to return to Tokyo from Hiroshima, the total cost would be 60,200 yen, which is more expensive than a 21-day pass. If you plan to visit more than one city by bullet train on your trip to Japan, a rail pass is an absolute must. There are a few different agents you can use to order your Japan Rail Pass. Be sure to check the details. Some airlines sell rail passes, but you must book your airlines ticket with them as well. Here are some of the main agents through whom you can purchase the pass: Tobu Top Tours, JTB Corp., KINTETSU INTERNATIONAL, Japan Airlines, Nippon Travel Agency, ANA Sales Americas (Los Angeles), and JALPAK. Check the website for details on how to purchase a rail pass. 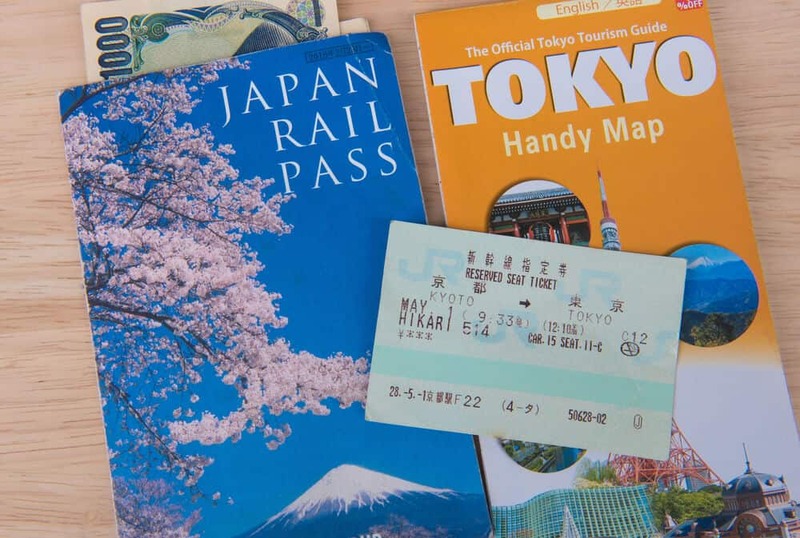 As well as the Japan Rail Pass, there are other special tickets and passes you can buy to cut costs on your trip to Japan. Some tickets are regional, but others can be used all over the country. This is another offer from the JR (Japan Rail) company. This ticket is similar to the Japan Rail Pass, but it is more limited. However, the reduced cost makes this pass a great option if you’re trying to travel on a budget (and have lots of time). The Seishun 18 ticket is a seasonal offer only. You can use the ticket for a 5 day period either during the summer (mid-July to early September) or in the winter (early December to early January). The exact dates are released when the tickets become available. You can use this pass for unlimited travel on all local and rapid JR trains. You cannot use it on Shinkansen rides (bullet train) or on limited express travel. The Seishun 18 is a 5-day ticket, costing 2,370 yen per day – a total of 11,850 yen. A fraction of the price of the Japan Rail Pass, this is a great option if you want to do lots of little trips or one or two big journeys during the 5 day period. Interestingly, the ticket can also be shared between up to 5 people. You could have use of it for one day each and your friends could use it the other days. You can buy the Seishun 18 ticket in the JR East station travel centers, or at JR Ticket Offices. Advance booking is available. Dates for when the passes go on sale are listed on the website along with the details, which usually becomes available from 1 to 3 weeks before the pass becomes available. Hakone is an amazing place to visit. It is filled with stunning natural beauty, especially when the autumn leaves change and the cherry blossoms bloom in the spring. Whatever the season, Hakone is a wonderful place to visit. Amazing hot springs, outdoor walks, mountain hikes, surrounded by peace and quiet. It’s pure bliss. The Hakone Free Pass is a must for people heading out that way. 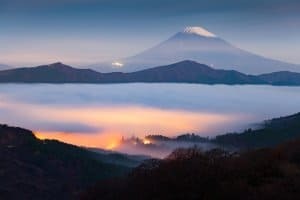 It gives you free travel on eight different types of transport in the Hakone area for a 2 or 3 day period, as well as discounted entry to dozens of attractions, including hot springs, museums, galleries, historical sites, parks, restaurants, shops and more. A full list is available on their website. The Hakone Free Pass has different prices depending on where you depart from. While you can get passes that are valid from Machida and Odawara, most travelers start their journey at Shinjuku. However, if you are heading off from one of the other two locations, be sure to check out the details as those tickets are a little cheaper. Hakone Free Passes can be purchased at any Odakyu line station, including Odakyu line ticket machines. 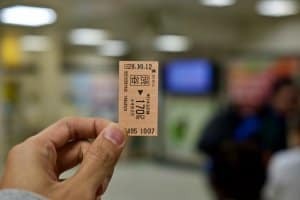 If your trip to Japan will be focused in and around Tokyo (there is so much to do there that you could easily spend your whole holiday there) then you should consider buying the Tokyo Wide Pass. This 3-day ticket offers unlimited travel in Tokyo and the surrounding Kanto area. 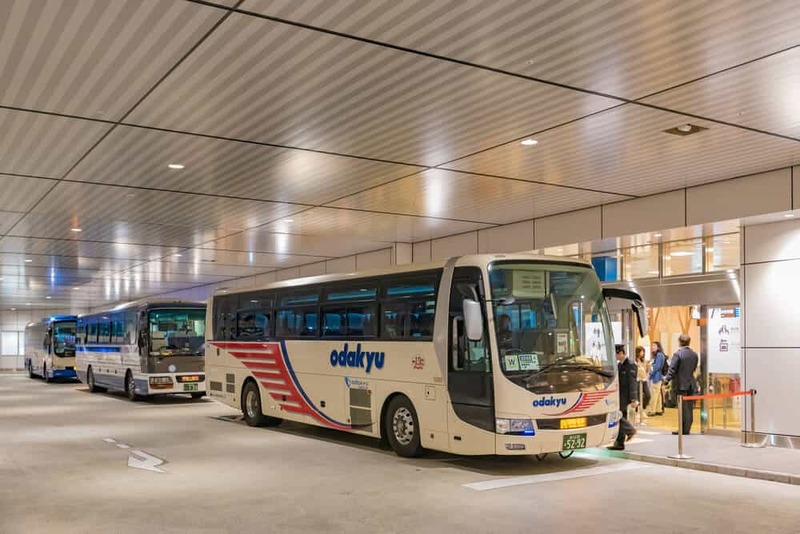 Including both the Narita and Haneda airports, you can pick up your pass on arrival, and it will cover the cost down into central Tokyo, and everything else for the rest of the period of validity. Like the Japan Rail Pass, this ticket is only available to people with a tourist visa. As it is only valid for 3 days, you could easily get yourself one of these passes to use for a few days in Tokyo, then after that head off around the rest of the country using a Japan Rail Pass. The 3-day pass is 10,000 yen for adults and 5,000 yen for children aged 6 to 11. 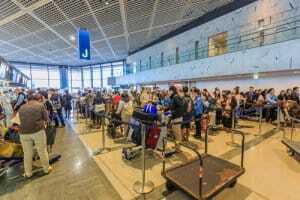 You can buy a Tokyo Wide Pass at the JR Ticket Offices and JR Travel Agents located in the Haneda International Airport and in the Narita Airport terminals 1 and 2, and 3. The passes are also available at JR travel centers and general travel service centers at various locations, including Shinjuku, Tokyo, Ueno, Shinagawa, Shibuya, Ikebukuro, Yokohama, and Mito. Check the website for details. Train passes are good for people who want to travel a lot, but what if you only want to explore one or two areas? While the rail passes are, on the whole, cheaper than buying individual tickets, they are still quite costly if you aren’t going to be getting a lot of use out of them. So if this applies to you, take a look at budget local airlines for domestic travel. Several airlines in Japan offer flights to various locations, and often at a fraction of the price of the same journey by train. Of course, you need to factor in all costs to make sure you’re getting the best deal. Keep in mind that getting to the airport might involve time-consuming/costly trips on the subway or train. However, this depends on the city. For example, in Fukuoka, the airport is only a 5-minute subway ride away from the central train station. 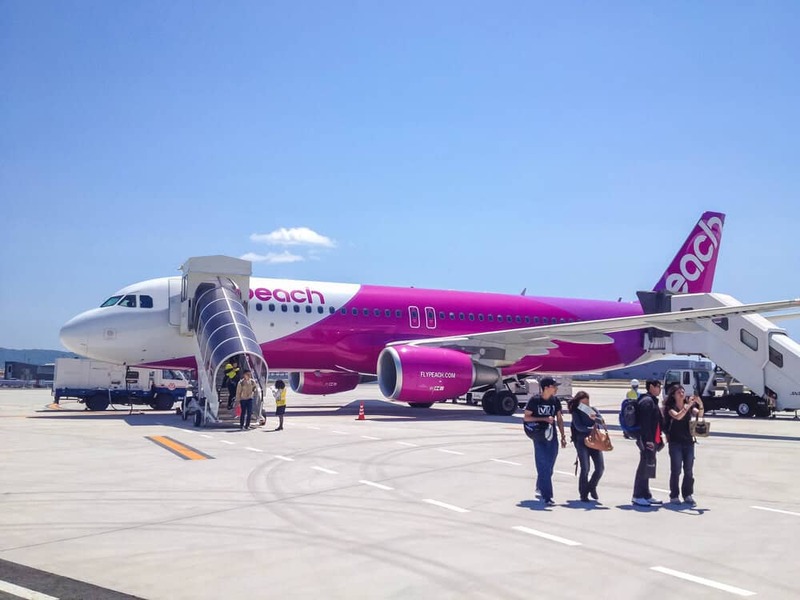 Two of the most well-known budget airlines in Japan are Peach and Jetstar. Both of these airlines fly to a variety of locations, including Tokyo, Osaka, Kyoto, Sapporo, Kagoshima, Fukuoka, and Nagasaki. Other popular domestic airlines include JAL (Japan Airlines), ANA (All Nippon Airways), Skymark Airlines, Vanilla Air, Spring Airlines and Solaseed Air. Taking a plane instead of a train, even for a short journey, can make a huge difference in price. For example, reserving a seat on the train from Kumamoto to Tokyo will cost a total of around 27,000 yen (and take about six hours!) whereas the same journey by plane (using Jetstar airlines) will cost less than 7,000 yen. Taking the train from Kagoshima to Osaka will set you back around 22,000 yen, vs. a flight on Peach Airlines can cost you less than 6,000 yen. That’s a huge discount! If you prefer to take Japan Airlines or ANA Airlines, here are a couple of special discounts you can use. JAL: Special Japan Explorer Pass – 10,800 yen flights to over 30 different cities in Japan. Restrictions: Only for short-term visitors. Must have a ticket leaving Japan to be eligible for this special pass. You also need to purchase these flights directly through the JAL website. ANA: Experience Japan Special Fares: 5,400 yen flights to cities within Hokkaido, or 10,800 yen flights for any other destinations. Restrictions: You need to reside outside of Japan, have a passport from a country other than Japan, and have an international ticket leaving Japan. Probably the cheapest way to travel long distances in Japan is by bus. Taking a highway bus is not the most popular option, but can be a great way to save money on both short and long trips. A popular bus provider is Willer Express. You’ll be surprised to know that you can make online reservations in English when booking through Willer Express. Most other bus companies don’t have online or English reservations. Other companies to look into are Japan Bus Online, Hankyu Bus, and JR Bus branches (split into eight regional companies). Most bus companies offer different types of seating for overnight buses. These range from the cheapest 2-seater style seats (think of an American school bus) to super comfortable individual seats. The price difference is significant, but if you’re taking a long bus (over 8+ hours) I highly recommend that you purchase a better seat. The buses with 3 seats per row are very comfortable. The seats are not connected, which makes it feel like you have your own personal space. 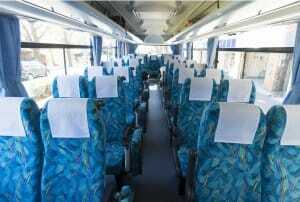 I took an overnight bus from Kobe to Tokyo on Willer Express with the cheapest seats (which was only 2,500 yen or so). While the bus looked new and the ride was smooth, it was the one of most cramped, cold (it was during winter), and uncomfortable experiences of my life. The better seats were 2 to 3 times more expensive, but I would definitely purchase those seats next time. These upgraded seats would still be much cheaper than taking a bullet train. Taking the bus can also save you on money on hotels. You can sleep on overnight buses that run late into the night. If you plan on traveling all around Japan, consider the Japan Bus Pass. This pass can be used on all daytime and overnight buses provided by Willer Express. There are 3-day, 5-day, and 7-day passes, with 2 different prices depending on if you’ll be using it from Monday to Thursday or over a weekend period. A 3-day Monday to Thursday pass costs just 10,000 yen. There are a few rules. The pass can be used for up to 3 rides per day, but you can’t use it on premium buses. However, on the plus side, this is one of the “only for foreign visitors” passes which can also be used by foreign residents. That means that JET teachers and other ex-pats who usually miss out on the great travel deals can use the Japan Bus Pass. Finding a place to stay is one of the major concerns for people wanting to travel Japan on a budget. There are tons of luxury hotels that cost a fortune, but there are also lots of budget hotels as well. A discerning eye can track down cheap accommodation all over Japan. The key is knowing what kind of lodging to look for, and where to find it. Booking online is one of the most popular ways to find accommodation these days. Actually, it is the best way to find cheap hotels. With price comparison websites and dedicated travel companies providing endless lists, this is the best place to start your search. However, bear in mind that these websites have more listings in big cities. Small towns in the countryside will probably yield very few search results. If you’re hoping to visit somewhere off the beaten track, you may need to find other ways to find lodging there. One of the best websites to use is Booking.com. This website is easy to use and often has great deals. It is also a reputable company that most people trust. I recommend Booking.com because it offers a whole range of different sorts of accommodations. From fancy hotels to local ryokans, you can find something in your budget. However, there are some popular hotels that are not listed on Booking.com. Agoda.com comes to the rescue in most cases. Most of the lodging options that aren’t listed with Booking.com can be found on Agoda. I always check both of these websites anyway, to compare prices for the same hotels. Other good websites are Rakuten, Hostelworld, Japanican and Jalan. If you’re having trouble finding something, or the hotel you want is fully booked, check out the Japanese version of the site. Particularly on Jalan and Rakuten, it might appear that something is fully booked, but when you check the local website, there is still availability! Also, the Japanese website sometimes lists a cheaper price. The only downside to this is you need to be able to read Japanese. However, if you are just booking a room (no meals or other services) you can probably book a reservation in Japanese by using “rikaichan” which is an add-on to the Mozilla Firefox browser (for Google Chrome, the extension is called “rikaikun.” When you turn it on and hover your mouse over Japanese characters, it will show you the reading and the definition of the word. 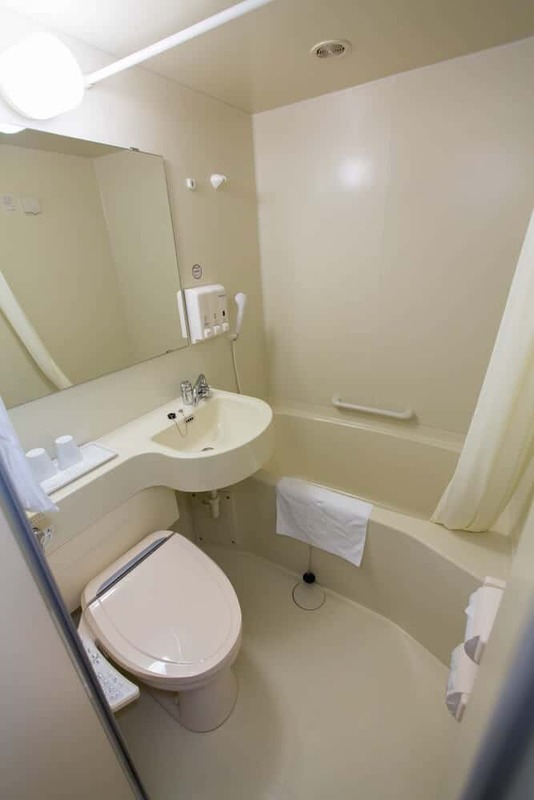 One of the most affordable types of accommodation in Japan, business hotels are certainly “no frills, ” and you get what you pay for. They are hugely popular, as the name suggests, with Japanese business people (mainly men) who travel a lot for work. Business hotels are a good choice if you plan to explore Japan all day and just want a bed to sleep in at night. You find them all over Japan, with many big chains all over the country, with their rooms looking the same whether you’re staying in a big city or out in the countryside. Major companies to look out for include Toyoko Inn, Daiwa Roynet Hotel, Dormy Inn, Chisun Hotels and Route Inn. How Comfortable are Business Hotels? Rooms are functional with minimal decorations. Some rooms can be very small (the bed and drawers take up most of the space). Beds are very standard but usually pretty comfortable. There’s usually a TV, small refrigerator, a hot water pot, and internet access (either by ethernet cable or wi-fi). The bathrooms are usually very tiny but they do the job unless you are very tall or big. Most business hotel bathrooms are stocked with basic amenities (toothbrush, soap, shaving razor, etc.). 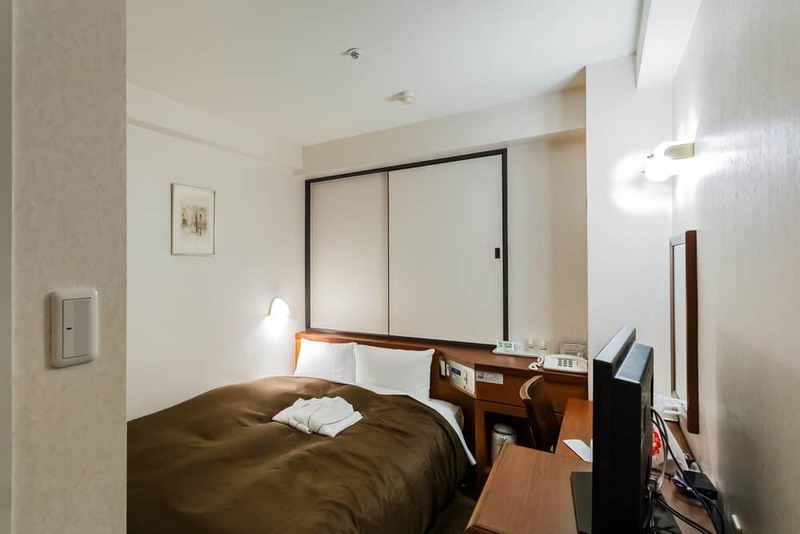 A single room in a business hotel will cost you between 4,000 Yen to 10,000 yen a night, whereas a twin or double room will be the cheaper option if split between 2 people. For a twin, prices are around 7,000 yen to 12,000 yen per night. One of the most famous types of Japanese lodging, staying in a capsule hotel is definitely an experience. The first ever capsule hotel opened in Osaka, Japan, and now you can stay in similar lodgings all around the world. They may look like fun, but capsule hotels aren’t always all that they’re hyped up to be. It is small, but not as small as most people think. Most capsules are big enough for you to sit up inside without hitting your head. However, it’s somewhere to sleep and nothing else. Also, many capsule hotels are for men only. They’re geared at businessmen and often don’t have capsules for women. Some capsule hotels have a “female only” floor, though. You’ll find them in big cities, but smaller towns throughout Japan are unlikely to have mixed gender capsule hotels if they have one at all. For the first day or so, capsule hotels are decently comfortable. However, it doesn’t take an expert traveler to know that these are not good for long term stays. There is only so many nights in a row that sleeping in what is basically a well-lit coffin can be counted as a fun novelty rather than an annoyance. 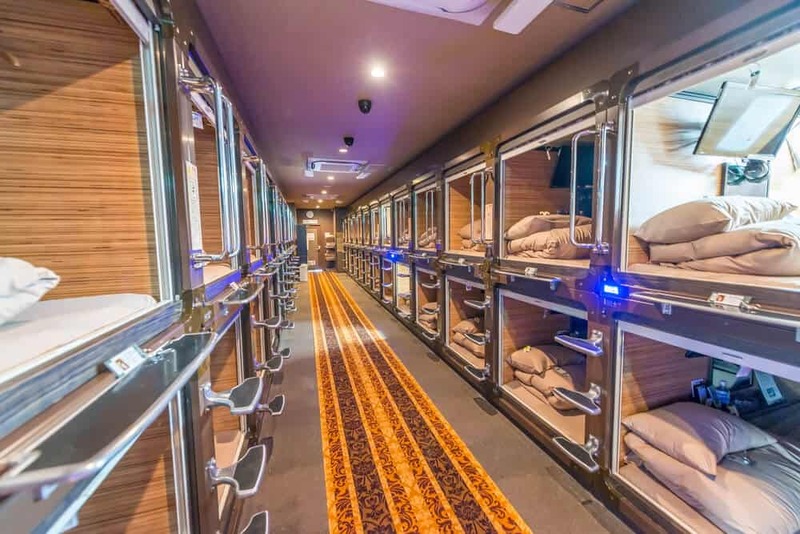 Depending on your fellow travelers, capsule hotels can easily be noisy, crowded places, and while many hotels offer lockers or other places to store your belongings, theft, while not rampant, is more common in these lodgings than in other types of accommodation. Capsule hotels are far from the most luxurious hotel, but they do come cheap! Spending a night in a capsule hotel can cost as little as 2,000 yen. However, is it worth it? Some travelers thrive on this sort of “simple” accommodation, but if it doesn’t sound like your cup of tea, move on to another type of hotel. At best, make your stays in capsule hotels a one-night-at-a-time affair when you are just stopping over or arriving somewhere too late to make use of a regular hotel room. In these instances, the low cost is worth the inconveniences. This is probably the type of lodging with the widest variation between properties. Some hotels in Japan are little better than business hotels. The rooms have basic furnishings, no decorations or excessive comfort, and is just somewhere to spend the night. At the other end of the scale, you have fancy hotels which are amazingly luxurious. Fully furnished rooms, spacious bathrooms, communal areas with massage chairs, gym facilities and even swimming pools. There is great variety between different hotels in Japan. The number of choices can be overwhelming. The good thing is that many hotels are conveniently located near to train stations or bus stops. Are Hotels in Japan Comfortable? This really depends on what kind of deal you’re looking for. 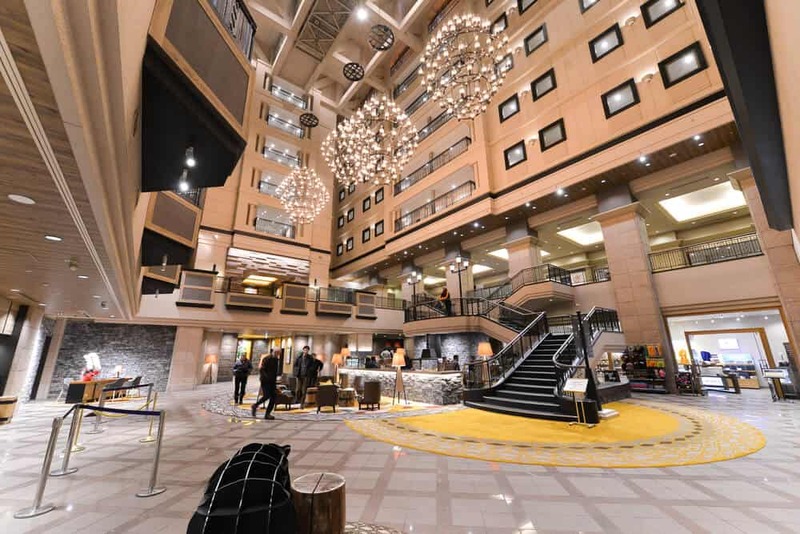 A cheap hotel will, naturally, not be very comfortable, but it will cost a mere fraction of the cost when you compare it to mega hotel chains like MyStays, APA or Nikko. In general, bigger hotels in Japan are comfortable and are good for both sleeping and relaxing in. Cheaper hotels are usually around 8,000 yen per night, with luxury hotels priced 30,000 yen to 60,000 yen or more per night. While many hotels might look out of your budget, it’s worth keeping an eye out for special deals. For example, the MyStays chain is a delightful place to stay, but with the rooms usually priced at 20,000 yen per night, it’s not exactly a budget choice. 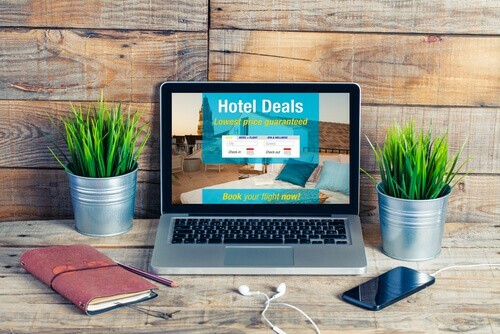 However, on websites like Booking.com you can regularly see special deals when booking in advance, which see those rooms listed at half price, or less! Why pay 8,000 yen to stay in a terrible business hotel when you can splash out a little and stay in a palace for 10,000 yen? Even budget travelers need to relax once in a while, so if you need a night of luxury, this is a great option to check out. These are types of traditional Japanese accommodation, which are just as popular with foreign visitors as they are with locals. Cheap hotels are all well and good, but if you want to experience local hospitality and step back in time, you can’t beat spending the night in a ryokan or minshuku. They are pretty similar, it’s just that minshuku tend to be smaller, located in older buildings and usually run as a family business. Ryokans are often run like this too, but sometimes they are located in newer, bigger buildings and have more staff with more services. Are Ryokan and Minshuku Comfortable? Staying in traditional Japanese accommodation isn’t for everyone. For starters, you’ll be sleeping on the floor on a traditional futon, and the flooring will probably have tatami mats rather than carpet. Sometimes ryokans and minshukus have showers, but often they only have traditional communal bathing facilities – and these will likely be down-to-earth and not luxurious unless you’re staying in an “onsen ryokan” which is specifically designed for spa relaxation. However, if you like experiencing different cultures in local style, these can be very comfortable places indeed. They vary a lot – some have fun, bubbly atmospheres like youth hostels, with a variety of characters lounging in the common areas, and are quieter than an emply library. Check reviews to see what other travelers think before you make a booking. These can vary quite a lot, particularly between little minshuku out in the countryside, and fancy onsen ryokan in a swanky location. 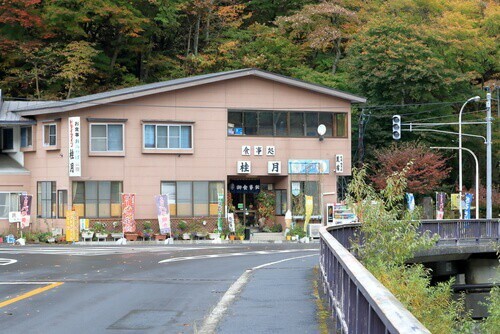 However, lodging like this is seen less and less in big cities – it’s more frequent to see ryokan and minshuku out in the countryside and on the outskirts of small towns. The cheapest minshuku can be seen at around 4,000 yen per night, up to about 9,000 yen per night. 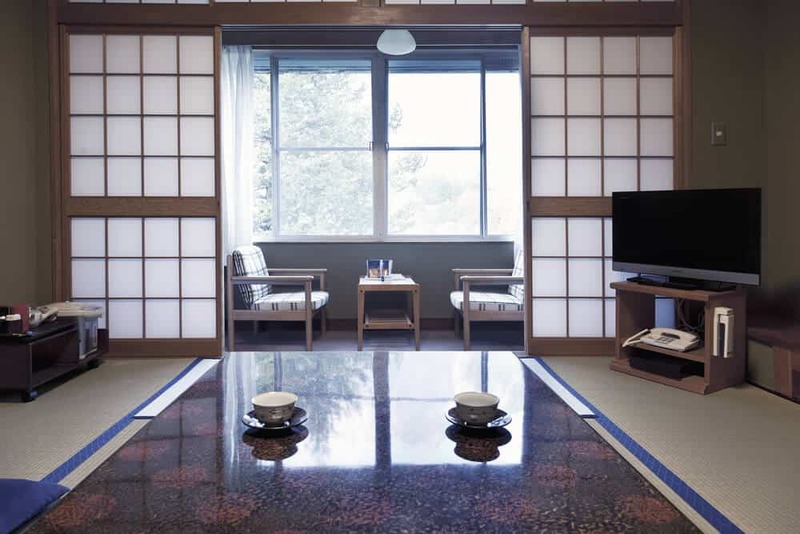 Ryokan can be as cheap as 5,000 yen or less per night, up to 60,000 yen per person for luxury inns. Be sure to check whether prices are per person or per room. 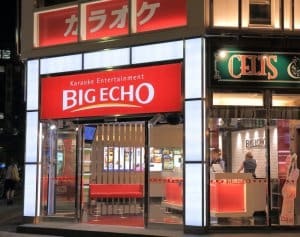 If you told a Japanese person that you were planning on spending the night in an internet cafe or private karaoke room instead of booking into a hotel, they’d probably think you were a bit weird. That isn’t because you can’t stay overnight in these places – it’s certainly a popular option. It’s just that few people plan to use this kind of accommodation. The usual overnight clients at these types of establishments are salarymen who stayed out too late drinking and don’t want to go home and face the wrath of their wives, or young party animals who missed the last bus home and need somewhere to stay. You can choose a public or private space, and choose between a normal chair, reclining chair, floor space or whatever other options they provide. Are Internet Cafes in Japan Comfortable to Sleep In? Generally not comfortable in at all. These rooms are not designed for sleeping in, they’re designed for surfing the internet or playing online games. You probably will not get a good nights sleep in a place like this. They can be noisy, uncomfortable and full of people who are doing anything but sleeping. However, they are super cheap, and often there are shower facilities which you can use for a small charge, and machines which provide free soft drinks, ice-cream, etc. If you want to try and get a good night’s rest in an internet cafe, be sure to choose the “floor” type of room. This is the only type of room that has enough space to lie down. The other types, come with reclining chairs, or small couches, which makes sleeping difficult. This depends on how long you stay. Some places charge by the hour, and others have deals where you can stay up to a certain number of hours for a fixed price. You may have to pay in advance. Generally, one night in an internet cafe or similar place will cost 2,000 yen or less. You can’t book in advance – just turn up, and be wary of busy times. There is usually a crowd around the time just after the last trains/buses have left, so be sure to arrive before then. Eating out in Japan can cost a lot of money if you don’t know where to go. When you arrive in Tokyo, everything looks so delicious it can be difficult to hold back, even when you know you’re on a budget. But there are several ways to make savings in Japan without sacrificing all the delicious culinary experiences that are waiting for you. Knowing a few tricks can save you a bundle – which you can use to treat yourself to a really extravagant meal. Use these tips to eat well while saving you some cash. Just because you’re cutting down on costs doesn’t mean you need to miss out on eating at restaurants during your trip. There are plenty of budget restaurants in Japan where you can get a tasty meal for a reasonable price. Following these few hints will ensure you get the best value for money without sacrificing your dining experience. If you want to find deals for food in Japan, lunchtime is king. Many restaurants have special menus at lunchtime where you can get the same food available in the evening, but at a lower price. The portions are usually a little smaller, but still worth it. There are some hearty lunch sets that will leave you stuffed until dinnertime though. Even fancy restaurants offer lunchtime sets for 1,000 yen to 2,000 yen. Cheaper restaurants sometimes offer a “one coin” lunch which will set you back just 500 yen (1 coin). This is especially a good deal for expensive foods like Kobe beef. Eating Kobe beef for lunch can save you a lot of money. Gyudon (beef bowl) is one of the more popular cheap eats in Japan, and it soon becomes a favorite of foreigners traveling Japan on the cheap. “Don” means a bowl (with rice), and “Gyu” refers to the beef topping. Plenty of different “don” are available throughout Japan. Kaisen don (fresh seafood and rice), tendon (tempura and rice), or katsu don (breaded cutlet of pork with rice) are delicious choices, but gyudon is the most widely available. 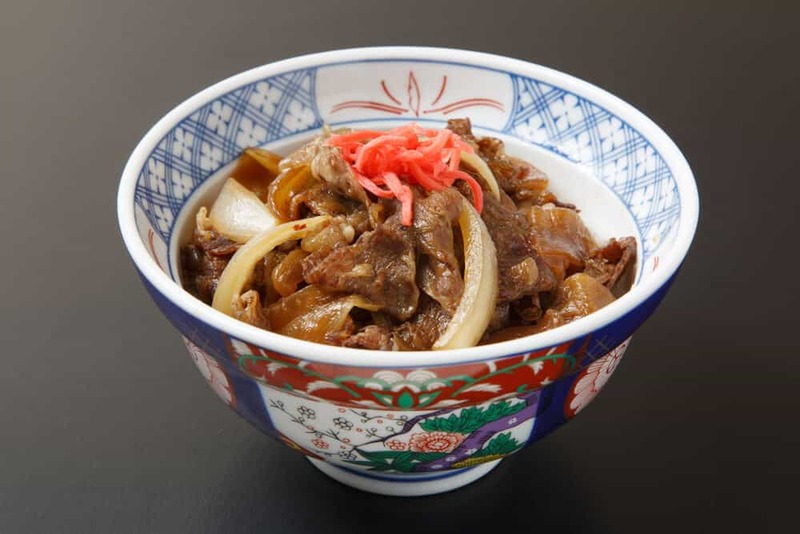 Thin strips of beef and slices of onion are simmered in a sweet sauce consisting of soy sauce, mirin (sweet rice wine) and dashi (Japanese broth). Gyudon sets are often accompanied by a raw egg (for dipping the beef in), miso soup, salad, pickles, and tofu. You can get extra toppings like kimchi, cheese, green onion and grated yam. 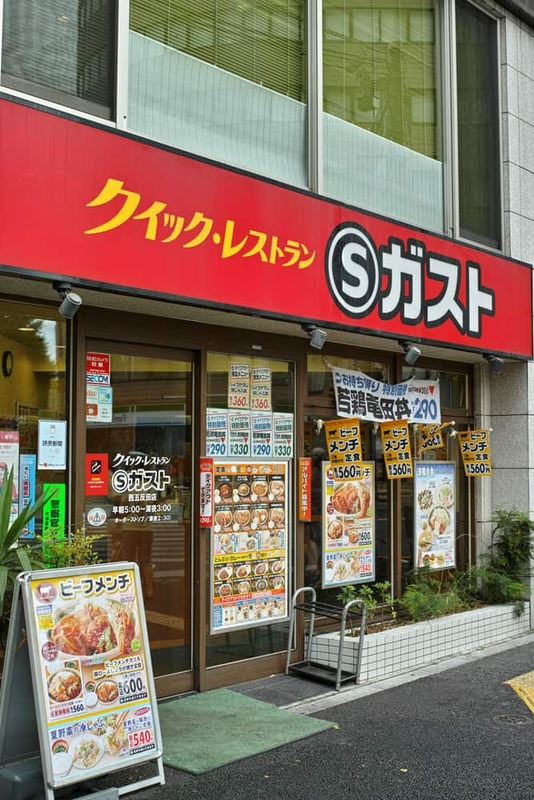 Popular chain restaurants where you can purchase these dishes, and other cheap options, are Sukiya, Matsuya, and Yoshinoya. You can find these restaurants all over Japan, serving gyudon in portions of different sizes depending on how hungry you are. A simple bowl of gyudon will cost you about 350 Yen (bargain!). For a set, you’re looking at between about 500 yen and 750 yen. An awesome deal for a quick and delicious meal for the hungry traveler. 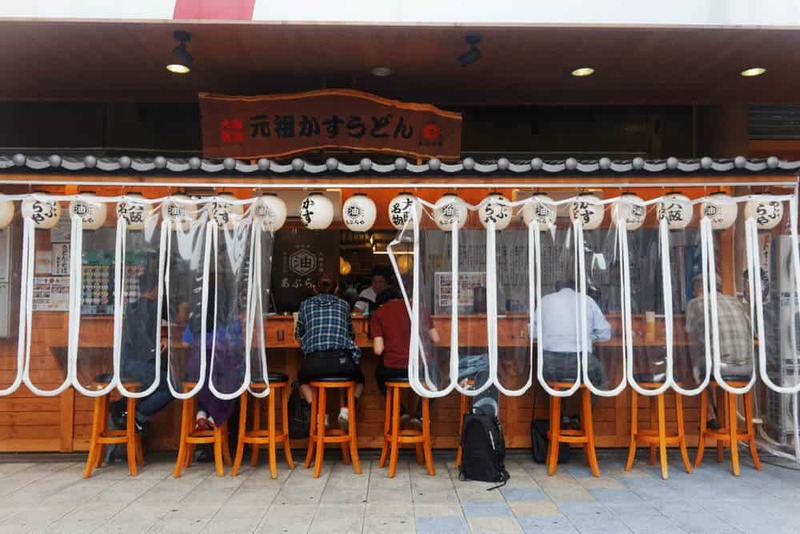 With a mix of Japanese and Western style food at low prices, these places are also a great choice for budget travelers as it allows you have a filling meal in a comfortable environment for a relatively cheap cost. They also tend to have cheap alcohol so are good of you need a treat! There are many different chains of famiresu in Japan, some of which have specialty dishes or styles, but they are all pretty much the same. Here are some of the big names which you’ll see around: Gusto, Royal Host, Jolly Pasta, Denny’s, Joyful, and my personal favorite, Saizeriya. Meals cost as little as 500 yen, but taste great. Teishoku restaurants serve meals that follow this basic principle: one main dish, soup, and one side dish. You order whichever main meal you’d like, and it comes with a little plate of pickles, perhaps some tofu or a salad, and a bowl of miso soup. These vary from place to place, but the combinations are the same. 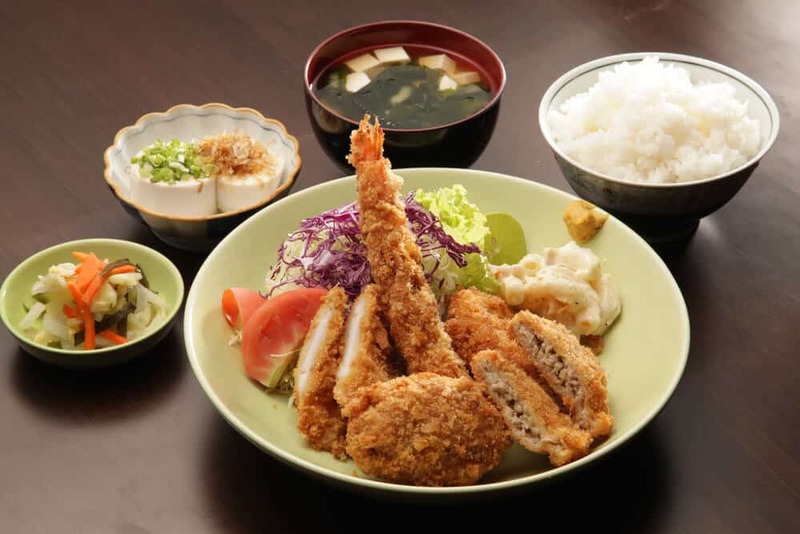 Main meals vary, serving seasonal products throughout the year but also traditional Japanese favorites: udon, katsu don, gyudon, karaage fried chicken, etc. Some restaurants have a vending machine at the front where you purchase a ticket for your meal. You then hand the ticket to the server once you’ve taken your seat. Food is cheap, ranging from about 500 yen to 1,000 yen for a meal. 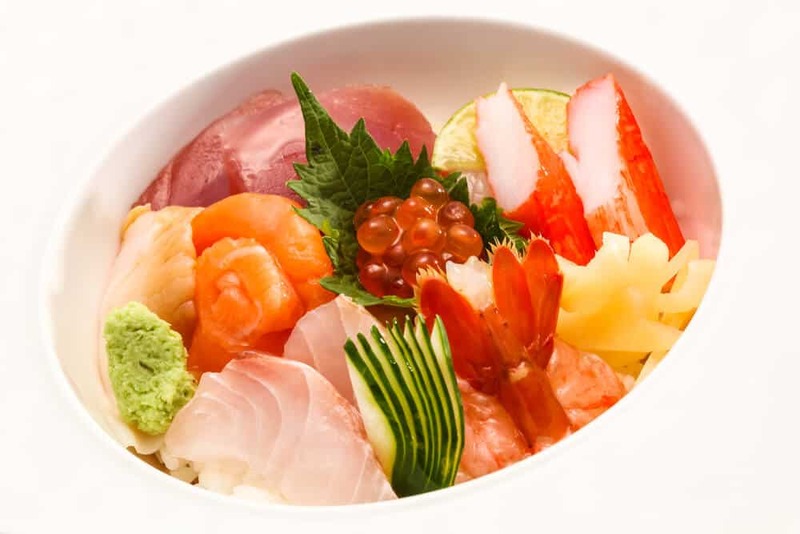 Teishoku meals give you a taste of popular Japanese foods that can be found all over Japan. You may not think of visiting a supermarket for food during your trip to Japan, but it’s actually a great place with lots of choices. Supermarkets in Japan, whether they are small or large, have a great selection of ‘prepared food,” and they usually have a microwave where you can heat it up too. Larger supermarkets will often have a seating area with tables where you can sit and eat. 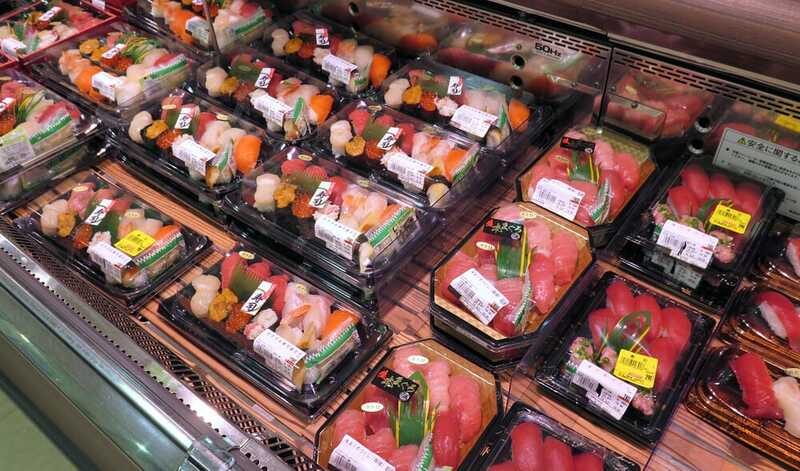 Bento boxes are a popular choice, with rice, meat, vegetables all packaged up neatly together. You can get all sorts of food in the supermarket – tempura, sushi, tendon, udon, salads, sandwiches, onigiri (rice balls), fried rice, Chinese steamed buns…the list goes on and on. Price wise, a small bento at the supermarket could be 300 yen or less, while bigger bento with lots of different dishes cost around 400 yen to 600 yen. The best thing about supermarket dining is the price discounts at the end of the day. From the early evening up until closing time, supermarkets reduce the price of their prepared food, making it even cheaper. At about 6:00 pm you can see savings of 10% or 20%, and then by 9:00 pm the reductions are as low as 50% off, or more. However, by this time it’s slim pickings and the other customers around at that time as just as eager to grab a bargain, so you have to be decisive and time your visit wisely. If you go too early the savings are small, but go too late, and all of the food is gone. This is a great option if you’re staying somewhere with a fridge. You can buy your meal late at night and then keep it for lunch the next day. If you really want to save money, you could easily get by on spending around 1,000 yen per day on food. If you aren’t fussy about how you spend your leisure time in Japan, it doesn’t need to drain your bank account to see and do amazing things. There are plenty of attractions which you can see cheaply, or even for free. Parks and temples are often free to visit, and while some specialist museums can be costly, many others have very cheap admission fees. Hiking and city walks don’t cost a thing, and attending local festivals are some of the best attractions you can see for free in Japan. For attractions you need to pay for, you can often get combination tickets or discounts. Some small towns offer a combination ticket to encourage visitors to see more of their attractions. Big cities offer pricier combination tickets where you can get entry to dozens of attractions with just one ticket. The best place to find out information about free and cheap attractions is at a local tourist center. Many centers have brochures with coupons for discount tickets, and the staff there can advise you on how to make the most of your trip for the cheapest cost. Free local guides are a popular way to see Japan on the cheap. Often run by volunteers who want to practice their English, taking a free tour can be done in a group or even on a one-to-one basis. Research free guides for the area you’re visiting to see what’s available. The cost of shopping in Japan varies greatly depending on where you are and what you want to buy, but the best tip I can offer you is to visit a 100 yen store. These shops sell everything under the sun, including stuff that tourists want to buy (like Japanese fans, hand towels, chopsticks, fake lacquer bowls). Almost everything in the store costs 100 yen (+ 8% tax) and if things cost more then they are clearly marked. 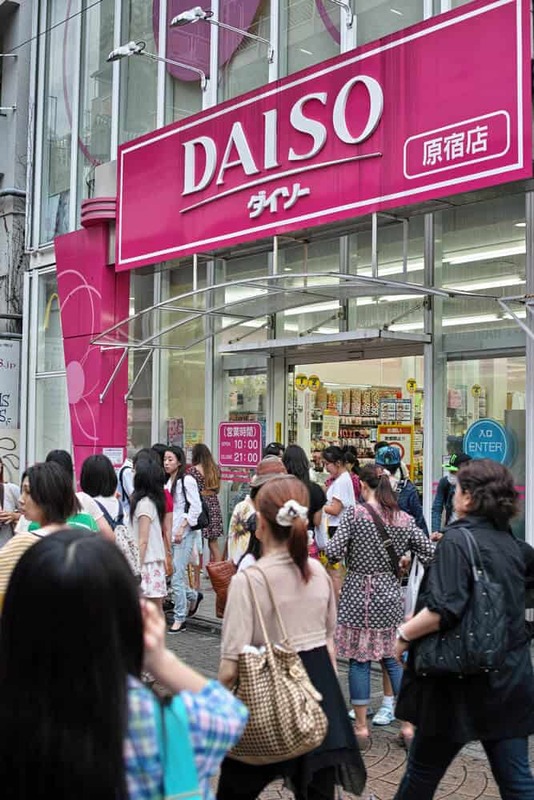 Popular 100 yen store shops are Daiso, CanDo and Seria.